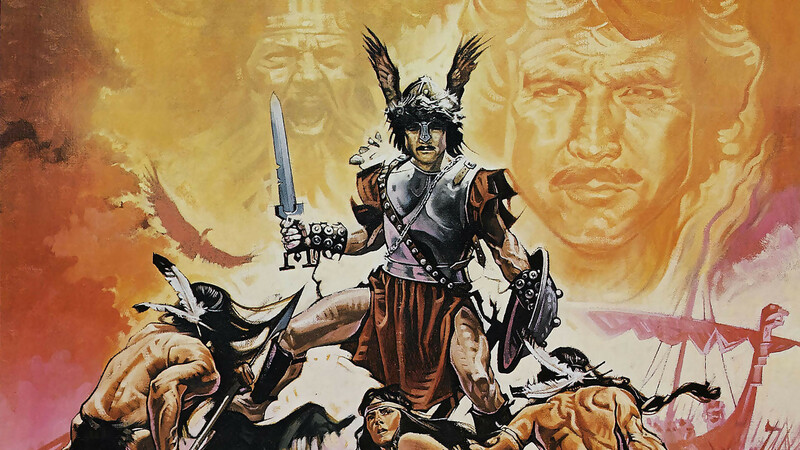 I’ve been hearing about a mythical film called The Norseman since I was a little kid. My dad would regale me with stories about a viking movie starring Lee Majors that for reasons unknown he was unable to finish. So, for years I’ve been searching for a copy of the elusive movie so my dad could finally figure out what happened to the intrepid vikings . The problem was that I couldn’t find the VHS/DVD/Blu-ray anywhere. I wondered if the movie was a myth perpetrated by IMDB and my Dad’s wonky memory. 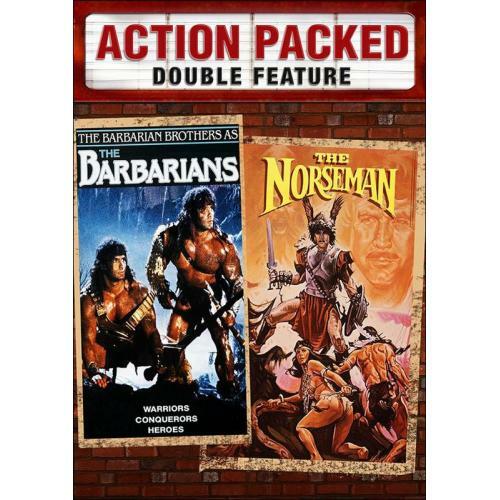 However, several weeks ago I was reading Ain’t it Cool’s weekly DVD updates and I saw a double pack of Barbarians (obviously starring the Barbarian Brothers) and The Norseman. I immediately purchased the DVD and we watched it together over the labor day weekend. As movie starts we were greeted with a lusty hoard of blond giants (Sans Deacon Jones) with furry earmuffs rowing a ship shrouded by fog towards North America. As the men expertly move the streamlined ship a man takes off his helmet and reveals an immaculately trimmed mustache. Lee Major’s steps forward and we meet our mustachioed hero who will rescue his father, woo a Princess, do like 17 flying high kicks and pinpoint EXACTLY where his kin are being held hostage on a massive continental coast line. Sidenote: Iroquois leagues weren’t formed for another four centuries. I looked over at my dad who had the expression of “Hey, it was 33 years ago when I watched this. Seemed legit at the time. ” The Norseman is not epic but it is memorable. It is stuff of Mystery Science Theater’s dreams. I’d wager it took six days to film in the Florida swamps that stand in for Newfoundland. They probably got the Hillsborough River State Park location for cheap and quickly realized how hot, sweaty and remote it was. Major’s wanted to get down to Miami so it was filmed in six days as opposed to the budgeted 27. The script flew out of the window, beards thrown on everyone and history was dammed (The Guardian gave the film a D- history grade). The Norseman is filled with exasperating moments of charming ineptitude. It has zero research, weird accents and Lee Major’s refusing to shave his mustache. I was astonished as Major’s walked around his ship flaunting his well manicured facial hair. His crew had the obligatory beards but Major’s shimmered with his outstanding stache. Who trimmed the thing? Were there mirrors? Had they invented scissors? Who dealt with the constant upkeep? My theory on the “stache” was that the studio could only make the film with Major’s and he refused to shave so they were stuck with an uncharacteristic viking who loved high kicks. 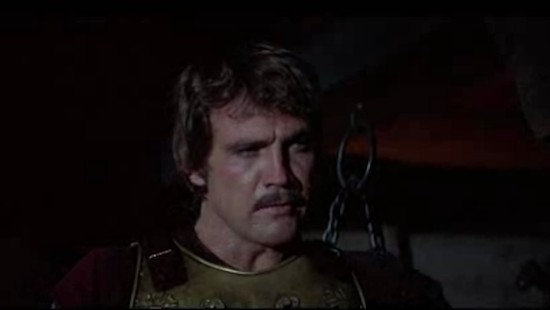 The Norseman centers around Lee Majors attempting to rescue his father from the jealous Iroquois nation. One of the Iroquois leaders was mad that a Viking was putting his lusty albeit respectful advances on a native so he and a gibberish spouting woman (Kathleen Freeman. You will recognize her) capture the Norsemen and blind them via hot pokers. So, Lee Major’s has to battle the native’s, rescue 20 blind people, spout monotone dialogue and pretend palmetto bushes existed in the north. Enjoy! Grow a mustache! High Kick some natives!